I love a good cocktail, and I tried to get here for several years. Plans would be made and then fall through. 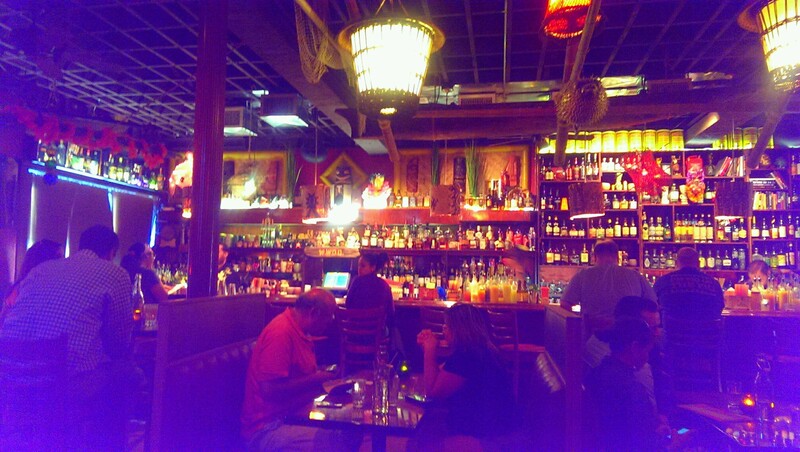 Finally I got a chance to go there for happy hour with some friends, and I fell in love with the place. The drinks are strong, the music is from the 1980s and the ambiance is top notch. The ambiance is also dark, so I had to use the flash to get the photos to be halfway decent. 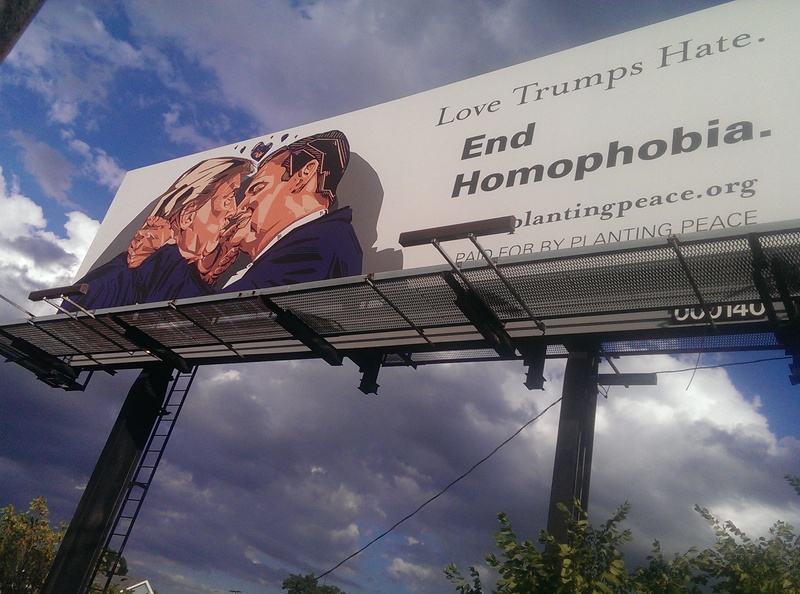 We ventured our way right before the Republican National Convention hit Cleveland because we heard the “Love Trumps Hate” billboard was nearby. In fact, it was on the left side of the bridge heading south just before you reach Porco. As far as I know it is still there. Whether Mr. Trump or his campaign staff saw it is doubtful. All of the drinks here are hand-crafted and incredibly tasty. 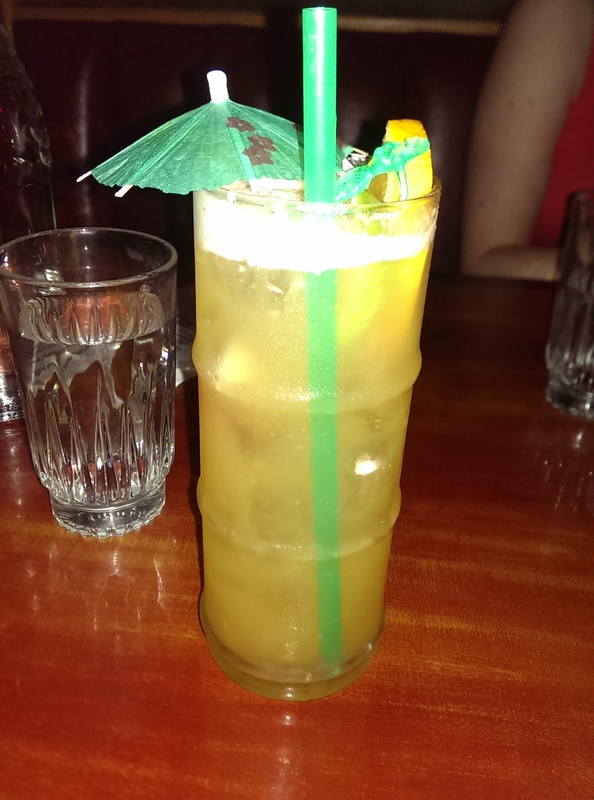 My first choice was the Planet of the Apes, which features banana, pineapple and orange flavors and three rums. I loved it. 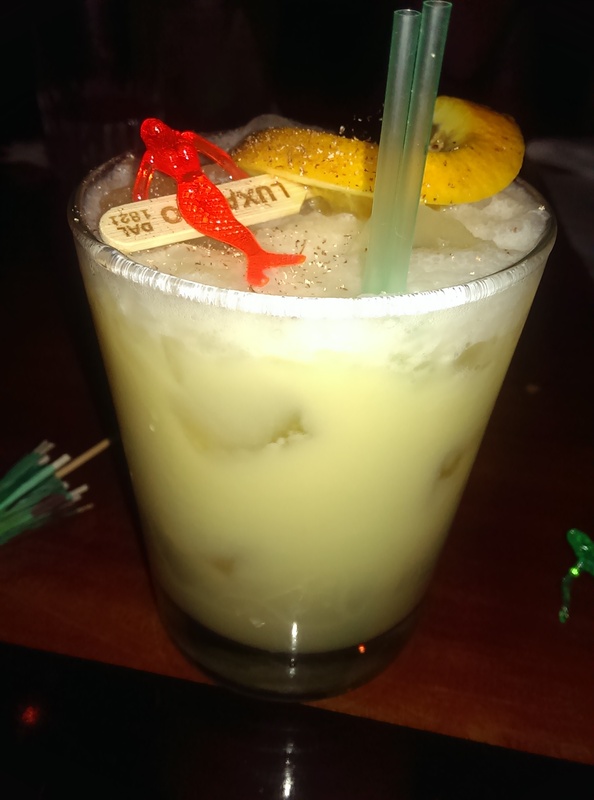 I’m all about fruity drinks, and if they are garnished with a plastic mermaid all the better! My friend ordered a Gin Mai Tai off the happy hour menu. We all loved it so much we ordered it for our second round. It was super refreshing. 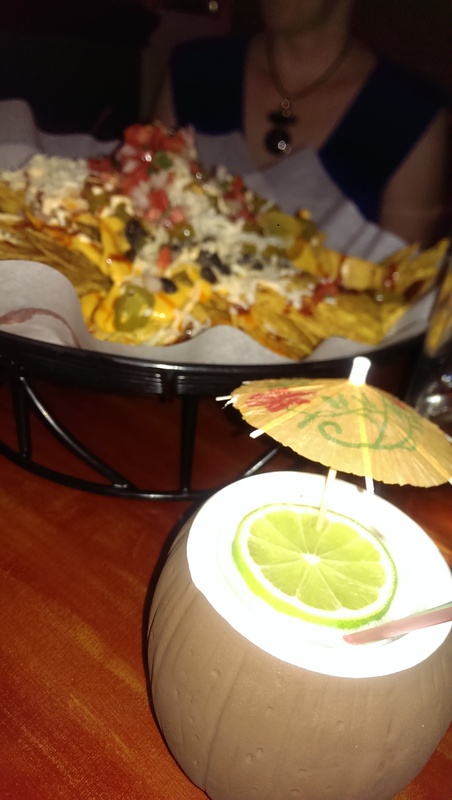 Since the drinks are so potent and I was driving I ordered a non-alcoholic tiki drink for my third drink. The waitress had them make up some kind of fruity drink that was heavy on coconut and pineapple flavors. I left a very happy camper. I was hungry, so I wanted to order something to nibble on. I decided to order the Closing Time Nachos, which are advertised as having pretty much everything in the kitchen on them. 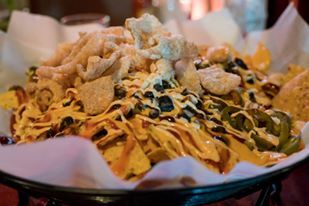 This includes tortilla chips, black beans, jalapenos, pork rinds, melted cheese, BBQ sauce, chorizo, salsa and pulled pork. I ordered them with “no meat” and they came without the chorizo and pulled pork, but with those lovely pork rinds. Our vegetarian just didn’t eat those. More for us! The nachos were absolutely magical. I loved the addition of BBQ sauce, which gave it a hint of sweetness. I was craving them the next day. We soon went back for another happy hour at Porco a few weeks later. The nachos weren’t as magical because I ordered them “vegetarian” this time. Everyone agreed that something wasn’t the same. I think it was the lack of pork rinds and the light hand with the BBQ sauce. They also appear to have added pico de gallo. We weren’t as hungry as we were the first time, and there were only two of us. Luckily my friend’s boyfriend showed up and was drunk and hungry, so he ate half of them for us. This time I ordered Heart of Darkness, which features passion fruit, honey and citrus with some alcohol. I love me some passion fruit. My second drink was a Limon Dee, which they bill as tasting like a key lime pie. It did not disappoint and came in a fake coconut, which I was particularly thrilled about. I can’t wait to try the Fogg Cutter, complete with dry ice. Pro tip: go early, if you can. We try to arrive between 4:30 and 5:00 and have managed to park in their small parking lot and get seats in the air-conditioned main room. It has been too hot to enjoy the patio, but once the weather cooled we enjoyed a lovely night on the patio as well. This has quickly become my favorite bar in Cleveland.